Shaniwar wada a palace fort in the city of Pune in Maharashtra, India. Built in 1746, it was the seat of the Peshwa rulers of the Maratha Empire until 1818 when the Peshwas surrendered to the British. The fort itself was largely destroyed in 1828 by an unexplained fire, but the surviving structures are now maintained as a tourist site. Following the rise of the Maratha Empire, the palace became the centre of Indian politics in 18th century..
Peshwa Baji Rao I, prime minister to Chattrapati Shahu, king of the Maratha empire, laid the ceremonial foundation of his own residence on Saturday, January 10, 1730. It was named Shaniwar wada from the Marathi words Shaniwar (Saturday) and Wada (a general term for any residence complex). Teak was imported from the jungles of Junnar, stone was brought from the nearby quarries of Chinchwad, and Lime (mineral) was brought from the lime-belts of Jejuri. 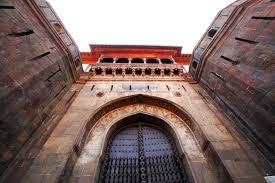 Shaniwar wada was completed in 1732, at a total cost of Rs. 16,110, a very large sum at the time. The opening ceremony was performed according to Hindu religious customs, on January 22, 1732, another Saturday chosen for being a particularly auspicious day. Later the Peshwas made several additions, including the fortification walls, with bastions and gates; court halls and other buildings; fountains and reservoirs. Currently, the perimeter fortification wall has five gateways and nine bastion towers, enclosing a garden complex with the foundations of the original buildings. It is situated near the Mula-Mutha River, in Kasba Peth. Despite its cultural value the fort is not maintained well by the Government. Its inability to maintain the historical Shaniwarwada from the funds provided by central archaeology department forced the fort’s advisory committee’ to woo business houses to fund Shaniwarwada’s makeover. Fort complex. The Dilli Darwaza is the main gate of the complex, and faces north towards Delhi. Chhatrapati Shahu is said to have considered the north-facing fort a sign of Baji Rao's ambitions against the Mughal empire, and suggested that the main gate should be made chhaatiiche, maatiche naahi! (Marathi for of the chests of brave soldiers, not mere mud). The strongly built Dilli Darwaza gatehouse has massive doors, large enough to admit elephants outfitted with howdahs (seating canopies). To discourage elephants charging the gates, each pane of the gate has seventy-two sharp twelve-inch steel spikes arranged in a nine by eight grid, at approximately the height of the forehead of a battle-elephant. Each pane was also fortified with steel cross members, and borders were bolted with steel bolts having sharpened cone heads. The bastions flanking the gatehouse has arrow-loops and machicolation chutes through which hot substances could be poured onto offending raiders. The right pane has a small man-sized door for usual entries and exits, too small to allow an army to enter rapidly. Shaniwar Wada was built by contractor from Rajasthan known as 'Kumawat Kshatriya', after completing construction these people well known by name 'Naik'. The name 'Naik' was given to them by Peshwa. Even if the main gates were to be forced open, a charging army would need to turn sharply right, then sharply left, to pass through the gateway and into the central complex. This would provide a defending army with another chance to attack the incoming army, and to launch a counterattack to recapture the gateway. As the ceremonial gate of the fort, military campaigns would set out from and be received back here, with appropriate religious ceremonies.Mastani Darwaja (Mastani's Gate) or Alibahadur Darwaja, facing northThis gate was used by Bajirao's mistress Mastani while travelling out of the palace's perimeter wall. The Khidki Darwaja is named for an armoured window it contains. Named for the Ganesh Rang Mahal, which used to stand near this door. It could be used by ladies at the fort to visit the nearby Kasba Ganapati temple. This gate was used by concubines to enter and leave the fort. It obtained its second name after Narayanrao Peshwa's corpse was removed from the fort for cremation through this gate. The important buildings in the palace includes the Thorlya Rayancha Diwankhana (Marathi:The court reception hall of the eldest royal, meaning Baji Rao I), Naachacha Diwankhana (Dance Hall), and Juna Arsa Mahal (Old Mirror Hall). Since the buildings were destroyed in the fire of 1828, only descriptions of the living areas of the fort are available. All the state halls in the buildings are said to have doorways with exquisitely carved teak arches, with ornamental teardrop teak pillars shaped like Suru( cypress tree) trunks supporting the ceilings, which were covered with beautiful teak tracery, carved creepers and flowers. Exquisite glass chandeliers hung from the ceilings. The floors were made of highly polished marble, arranged in a mosaic pattern and adorned with rich Persian rugs. The walls contained paintings with scenes from the Hindu epics, the Ramayana and the Mahabharata. The buildings are said to have been designed and constructed by many well-known artisans, including Shivaram Krishna, Devaji, Kondaji Sutar, Morarji Patharwat Bhojraja (an inlay-work expert from Jaipur) and Ragho (a painter). One of the buildings in the Shaniwarwada complex was seven storeys high. It is said that the spire of the Sant Dnyaneshwar temple atAlandi, 17 km away, could be seen from the uppermost terrace of this building. 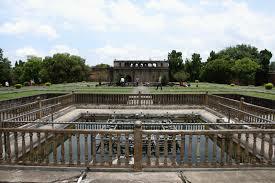 The complex had an impressive lotus-shaped fountain: the Hazari Karanje (Fountain of a thousand jets). 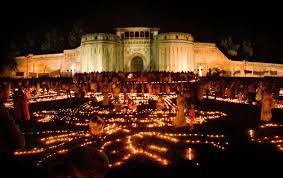 It was constructed for the pleasure of the infant Peshwa Sawai Madhavrao. It was designed as a sixteen petal lotus; each petal had sixteen jets with an eighty foot arch. It was the most complicated and intricate fountain of its time. 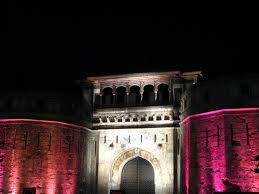 [ Captain More who visited the Shaniwarwada in 1791 described it as “very magnificent. A hundred dancers can dance here at a time. In one corner is a marble Ganapati statue and the palace is flanked by a fountain and a flower garden. By 1758, at least a thousand people lived in the fort. In June 1818, the Peshwa, Bajirao II, abdicated his Gaadi (throne) to Sir John Malcolm of the British East India Company and went into political exile at Bithoor, near Kanpur in present-day Uttar Pradesh, India. On February 27, 1828, a great fire started inside the palace complex. The conflagration raged for seven days. Only the heavy granite ramparts, strong teak gateways and deep foundations and ruins of the buildings within the fort survived.